Fly casting is symbolic and a special movement of all fishing methods. A feather weighted offering can be delivered silently to the designated spot, which only humans can do and also is the menace to all fish. Whether you can cast your fly at the target or not makes a big difference. We teach you the casting technique for actual fishing not competition casting. Basically what we lesson is overhead casting, side casting, roll casting and what not on a single hand rod. The key to success is to deliver your fly at the target at a blink. Lately double handers have been popular. I started using those since the late 90's and fished for steelhead and salmon in BC, Canada but after that I got to realize the assets of single handers. So I am not familiar with the modern Spey casting very much. By and large casting level of Japanese fishermen is higher than average on a planet. I won a few local casting competitions in Canada and outcast most people fishing beside me in most times. My casting might be characteristic in that I hate any extra false casts. I try to minimize the false casts and ideal way is to toss the line backward and punch it out forward. That's it. Speedy casting maximizes the time which fly stays in or on the water. Fish don't evaluate your beautiful line loops. The only thing fish care is a fly and its motion in front. I also use roll cast very often. It is almost like a single Spey cast on a single hander. You don't need to check behind you and cast instantly, which is mandatory for successful fishing. 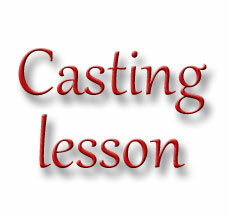 If you want to brush up your casting, feel free to contact us for details. Please bring your tackle. A #5-7 9"-ish single hand graphite rod would be good. Line should be cleaned for the best performance. Ask details for double handed rod. Uploading pictures and motion pictures in the internet is banned without authorization. Basic rate has to be pre-paid. Transportation cost may be necessary. If you are close, we will see in a river bank of southern Sapporo or lake. If you are from somewhere distant, basically our SUV is used. It is maintained and serviced by the excellent dealer. In case of accident, private car insurance covers your damage. Masa's driving license is Gold(top grade) with no accident/violation history record. But your items might not be covered when break-in happens by assholes. Basic menu starts at Sapporo Minami ward or Chuo ward. If you need accommodation, APA hotel in Kawazoe, Minami ward is recommended. Shuttle bus from Shin Chitose Airport, free bus from Makomanai Station available. If you want to be picked up at Shin Chitose Airport or other places, additional charge will be applied.